Krassimir Terziev, “Family” (2013), pigment printing on paper, 90 x 135, on display at “Future Unforgettable” show, Versus Art Project. The artist sits inside a flat-screen television. His daughter is sandwiched between him and his wife. They wear half-frowns of apathy, listless and aloof. The scene is the subject of an engraving titled, "Monument To The Time Elapsed III" (2018), one of two monitors scratched to frame images rendered with expert manual technique by Krassimir Terziev for his solo show "Future Unforgettable," at Versus Art Project till April 13. He cut the second engraving, "Monument To The Time Elapsed IV" (2016-2017) into a tablet screen. It is an auto-portrait. His hand reaches, as through an ethereal black background, toward the other on the opposite side of the device. He engraves with a photographic realism, opening his hand to grasp at the Pandora's box of the 21st century. The larger-than-life, meticulously etched selfie in "IV" reflects the stature of its creator. Terziev is a prominent, award-winning staple in the internationalist art world. His works frequently appear in institutions throughout the world, including Sofia, where he lives and works as a member of the Institute of Contemporary Art. He was a founder of the InterSpace New Media Art Centre, which ran from 1998 to 2004. In Turkey, he has appeared in fairs and exhibitions aplenty, from the Mardin Biennial to SALT Beyoğlu. Krassimir Terziev, "Study for Base and Superstructure," 2018, pencil on paper, 100 x 70 cm. "In the late 1980s the media of video entered the field of new Bulgarian art as a means of documenting performances, happenings and actions," wrote Terziev, in a first-person essay that he published at Open Art Files, elaborating on his broad liberal education which has spanned postgraduate studies in the painting department at the National Academy of Arts in Sofia, to the Cultural Anthropology program at Sofia University. "In the current decade art video on the contemporary art scene in Bulgaria is undergoing a new shift in dynamics." A pair of videos at his current Istanbul show were produced in 2015 and 2016, titled, "Between Flashback and Deja-vu." They document the bleak horizon that defines urban life in his Balkan nation as it continues to reel from the lingering maladaptation of the communist era. Bulgaria is located between Turkey and Romania on the edge of the EU. In six and a half, and nine minutes, respectively, his videos at "Future Unforgettable" employ flying drone photography to arrange dialogue on the divergent nature of perspective. The seer is seen when the agents of perception becomes the subject. Ascending to the window of his high-rise studio, the camera pans upward to survey the building, as it is scaled and increasingly spliced with a still frame shot from a tripod on the balcony. The fixed shot presents a panorama of the unsightly Sofia cityscape on a cold, blue day. The camera passes the stained concrete exterior of honeycomb apartments protected from the elements by rusted grilles and polished glass. The two cameras meet in a fit-inducing flicker. The effect is rendered in both videos. Postindustrial urban aesthetics are cast under a raw light. His unwavering gaze, absent of human presence, mixes an imagistic binary. He frames a nonverbal, moving conversation on the visual impressions of automation. The present, unsustainable life for human beings in the inhospitable realm of space has its equivalent in the utterly inconvenient truths of climate change. In purely mental terms, the mass majority of people on the planet today may as well reside on the moon. The infrastructure of modern life depends on energy sources that fuel space technology. As a planetary whole, moderns demonstrate an unhealthy degree of physical abstraction from the land, sea and air. To aestheticize and exploit the earth for politics and culture, is a bad habit of global society bent on infinite growth. It is a complex as mystifying as the origins of the universe. In the show, "Future Unforgettable," the art of Terziev, emphasizes the extraterrestrial needs of earthlings. His work, "Family" (2013), is reflected in the glossy flat-screen monitor on which he engraved the likenesses of his weary wife and bored daughter beside his characteristically glum mug. "Family" pictures a trio of astronauts, two adults flanking a child, all in space suits holding hands on the surface of the moon. 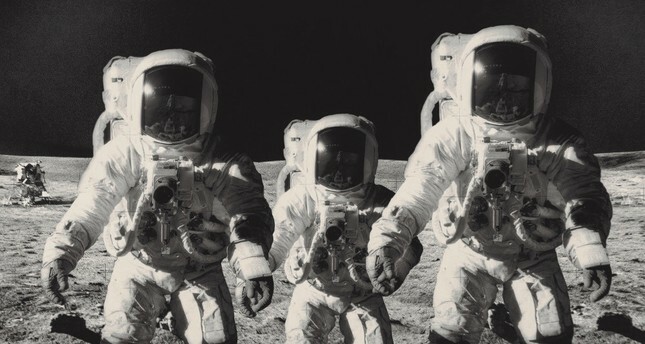 In the reflection of each face mask, Terziev quoted resemblances of the famed photographs from the Apollo 11 lunar mission. His recent intervention artwork, "Yet To Be Titled" (2019), manipulates the iconic photograph of the earth from space, said to have launched the environmental movement. The stark image shines through a lightbox, with the silhouette of a palm tree partially obscuring the magnificent aquamarine aura of the planet. While such themes may appear to unearth the contrivances of Cold War anachronisms, the space race continues. Turkey decreed its inaugural space agency in February not long before India became the fourth country to shoot down a satellite in March. The act challenged Israel's aim to follow Russia, China and the U.S. to the lunar surface in less than two weeks. Terziev is prescient. Three figures stand on the moon in "Family," and someone has arrived. "Outer space - the most successful metaphor of the eternally unreachable all - is still far enough to let us fill it also with all the technological garbage generated on the planet and the dreams for the future and salvation of humankind," wrote Svetlana Kuyumdzhieva, a notable Bulgarian curator who collaborates with Terziev. "For Krassimir Terziev domesticating space has been both subject matter and artistic strategy since 2008." Terziev has gone a step further, inviting a biblical sense of irony with his opposing works, "Apollo Albino Programme" (2017) and "Apollo Melanist Programme" (2018), in which animals, all white in the former and black in the latter, appear on the lunar surface to give the moon landing with a prophetic context, in the vein of Genesis, only with Noah as a spacewalker, and the ark a spacecraft. The only aspect of the story that may remain consistent is the flood, especially with the threat of sea level rise. Beyond the elitism of cultural manufacturing, art informed by technological advances takes on a special significance in a country like Bulgaria, which develops while stabilizing bordered territory potent with the age-old clash of neighboring, and internalized civilizations. It is a reality that Terziev drew astutely with pen on paper, for his piece, "Study for Base and Superstructure" (2018), which shows the transformation of architectural forms. The foundation of the fictive, agglomeration of building styles begins like a rectangular, steel skyscraper and soon encompasses the oriental archways of synagogues, the spires of mosques and domes of churches, topped with a communist star. His watercolors "How Many Policemen I" (2015) and "How Many Policemen II" (2018) illustrate the geometry of authoritarian power. Another painting, "Night For Day I" (2018) relates similar subject matter in shades of black. Its point is strengthened by the polarity of rigid, masculine officialdom standing on the edges of a pool filled with lively, public swimmers. Mirroring his black and white, or albino and melanist versions of the Apollo Programme, his dichromatic watercolors are reversed in "Night For Day II" (2018). The inversion of dominance, particularly in the context of nationalism, is cleverly presented in the photographic intervention, "Years Later" (2015). With subtlety, Terziev calls attention to the fact that when dependent on scientific progress, political acts are susceptible to change not only from within society, but also due to physical processes that are consistent throughout the known universe. "Years Later" reanalyzes visual documentation of the lunar landing, specifically the planting of national flags on the frigid, windless surface. As he explains in a wooden framed printed text, the last man to step on the moon was Gene Cernan, in 1972, who placed the sixth and final flag. But there is a striking photo op that has not made it into popular culture because no satellite has the capacity to reproduce the detail. The catch to planting national flags on the moon is that they all turn surrender white not long after they are left exposed to the ultraviolet light of the sun. Terziev relays the message that space is telling humanity, namely, that the relativity of opposites outlasts the petty competition over earthly differences. "Future Unforgettable" is an exercise in universal duality. Floating between celestial bodies, astronauts and spacecraft follow more fundamental laws than that promised by the futurist imagination. At the tail end of gallery halls at Versus Art Project, a wall tacked with photographs and texts depicts many examples of fallen debris, and how otherworldly they look on the surface of the earth.